There are many tough choices we’re faced with in life, but Farmers believes you shouldn’t have to make one when it comes to your pet. We all love our pets – they’re part of the family; but, sometimes an unforseeable tragedy can happen that we cannot feasibly pay for. Pet Insurance provides coverage when your pet needs medical care for unexpected accidents, illnesses, emergency care and every day conditions as well as provides optional coverage for routine and preventative care. You should not have to choose between your furry friend and your wallet. Any sudden start, stop, or turn may toss your pet onto the highway where it can get hit by oncoming traffic. It is estimated that at least 100,000 dogs die this way each year. Open truck beds also do not provide any protection from the weather. Hot sun can heat the metal floor of a truck bed enough to burn a pet’s paw pads. A dog left sitting in the broiling sun without water or shade may suffer from heat stroke before long. Do not leash your pet inside the truck bed -many dogs have been strangled when tossed or bumped over the side of the truck and been left helplessly dangling. If your pet is riding inside the car, Although most dogs love to stick their heads out open windows, wind can seriously irritate mucous membranes and blow pieces of grit into their eyes. Collars do not expand, but puppies and kittens grow quickly! If not loosened, collars can literally grow right into your pet’s neck, creating an excruciating, constant pain. Check your pet’s collars at least every week until it is full-grown (that can be more than a year for really large breeds of dog). You should be able to easily slip two or three fingers between the pet’s collar and their neck. It’s vital that you put a collar and an ID on your young pet, just in case he slips by you and gets lost. Poisonings can happen from a number of sources and pet owners won’t necessarily be able to identify exactly what is wrong, because the symptoms can range from general vomiting and diarrhea to lethargy and excessive salivation. While those are not the only signs, if you even suspect your pet has ingested something toxic, call your veterinarian immediately. 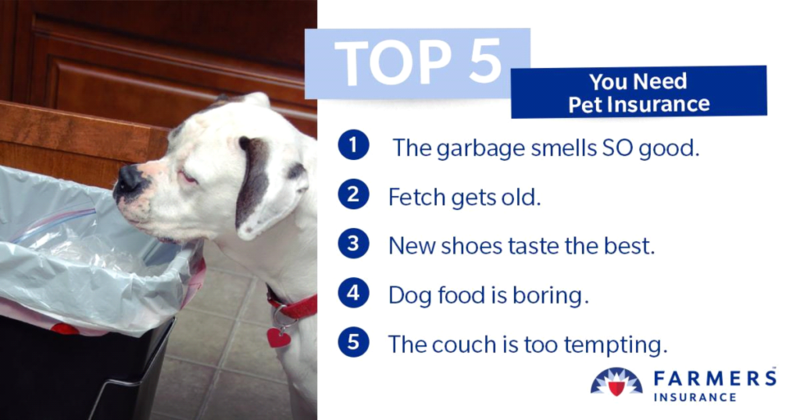 Some major things to watch out for are medicines, diet foods, sugar-free gums and candies, food or toothpaste containing xylitol, and many other things that may be safe for humans but could be deadly to your pet. Plants can also be a threat to your pets. Something you should watch out for espicially with cats is lilies. Lilies of the Lilium or Hemerocallis families are highly toxic to our feline friends and if ingested can cause permanent kidney damage. Other plant materials in the landscape that are lovely in the garden can be toxic to our pets. Because this list is so lengthy, it is good practice to monitor your pets when they have access to your landscaped space. Ensure they don’t chew or consume plant materials or their fruits/berries. Routine and preventive care helps to catch diseases early to help your pet have a longer, happier life. Coverage includes annual wellness exams, routine shots, flea/tick/heartworm medications, spaying & neutering, routine diagnostic tests, routine dental cleanings, and micro-chips.